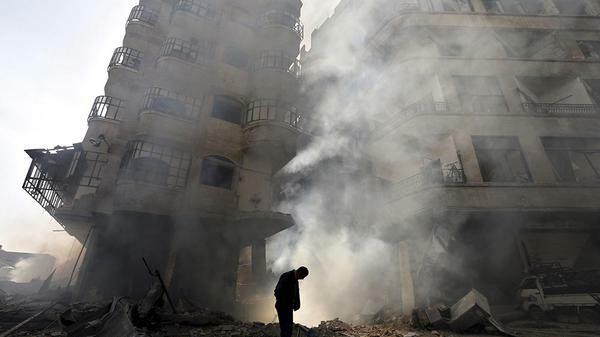 Islam Around Us: Syrian air force bombs hospital in north, say activists. Syrian air force bombs hospital in north, say activists. Beirut | Reuters | 12 Sep 2013 :: Syrian warplanes have bombed one of the main hospitals serving rebel-held territory in the north of the country, according to activists and video footage. Eleven civilians, including two doctors, were killed in the strike against the hospital on Wednesday in the town of al-Bab, 30 kilometers northeast of Aleppo city, the opposition Aleppo Media Centre said on Thursday. Video footage posted on YouTube showed the limp body of a young child being carried out of the hospital by a man. Another boy lies on the floor, blood on his head and dust covering his body. In the video, dust fills the air. Rubble and smashed up air conditioning units lie on the floor. The Aleppo Media Centre said that the emergency and radiology departments were destroyed in the attack. Syrian jets have bombed civilian schools, hospitals and bakeries - illegitimate targets under the laws of war - during the two-and-a-half--year conflict which started with pro-democracy protests against four decades of Assad family rule. More than 100,000 people have been killed and divided world powers have been unable to halt the violence. The government has not commented on the strike but state news agency SANA said on Thursday that the army had killed 14 “terrorists” - a term it uses for rebels - north of al-Bab in an operation on a militant convoy.